Oh, Canada. Our northern neighbors love them some mixed martial arts and the UFC knows it. Shortly after announcing the Octagon would be making its debut in Calgary on July 21st, the world’s premier MMA promotion reported Toronto and Montreal will also be getting shows in 2012. Following UFC 149 in Calgary, UFC 152 goes down September 22nd in Toronto and UFC 154 will take place in Montreal on November 17th. The trio will all be pay-per-view broadcasts. The UFC will invade these same three cities in 2013. 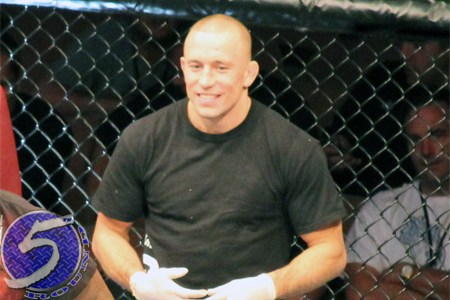 UFC welterweight king Georges St-Pierre (Pictured) announced the Montreal card via satellite. Depending upon how his surgically-repaired right knee comes along, the 30-year-old his hoping to make his return to action in the event. The UFC has held eight shows in Canada – four in Montreal, two in Toronto and a pair in Vancouver. They hosted three Canadian events in 2010 and in 2011.